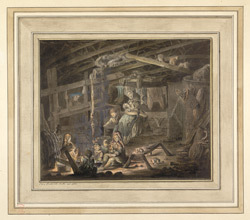 Scene inside the weaver's house near Bowmore on Islay, drawn by John Frederick Miller during a 1772 trip to the Hebridies. The King's Topographical Collection also has a copy of this same scene. Islay is the southernmost Hebridean Isle, located off the west coast of Scotland. It is a small island but during the 17th & 18th centuries it had a thriving community. Spinning and weaving were important activities in Scotland and tartan fabrics were hand made on large looms like that visible to the left of this picture. Wool was purchased by cloth merchants who supplied the weavers and paid them to create the fabrics. Many weavers were poor, living and working in very bad conditions. By the mid 19th century with the introduction of power looms the cottage industry declined and more tartans were produced in factories. Today the population of Islay stands at around 5000 and it is well known for its single malt whisky distilleries.